Pittsburgh Post Gazette, October 1, 2016 by Bob Batz, Jr.
Norma Bauerschmidt, who inspired millions around the world by choosing to live the end of her life rather than undergo cancer treatment, died Friday morning the way she wanted ~in her bed in the motor home in which she and her family had been traveling the country. 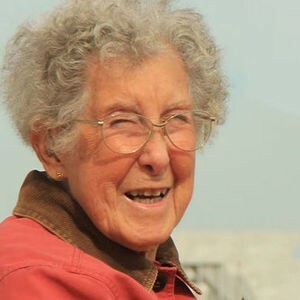 She was 91 and had made it to Friday Harbor on San Juan Island, Wash., where last month she saw her first killer whales. That was one of many highlights on a year~long road trip from her former home in Presque Isle, Mich., with her son, Tim, and his wife, Ramie Liddle, a native of Zelienople. They and poodle Ringo had paused at a Butler County campground this past June, nearly 10,000 miles into their nomadic assisted~living adventure in a 36~foot RV. Ramie had chronicled it from the start ~ Aug. 24, 2015 ~ on a Facebook page she titled Driving Miss Norma. She thought it would be a way for family and friends to follow them and boost their morale on a trip that Tim didnÃƒÂ¢Ã‚Â€Ã‚Â™t expect would make it to Mount Rushmore. But their joyful journey through the West, South, Northeast and back to the Midwest ~ with stops at national parks and other attractions ~ captured the attention of millions, not just for the fun they were having, but also for the way they were facing the issues of end of life. The Facebook page alone had nearly a half~million likes, making her a public figure, and their story was chronicled by countless media outlets, including the Pittsburgh Post~Gazette, Huffington Post, NBCÃƒÂ¢Ã‚Â€Ã‚Â™s Today show, CBS Evening News and BBC Radio. As her health started to decline at the end of August, the Facebook page continued to keep fans intimately apprised of her ups and downs (they attended the county fair the same day she started home hospice), and that the grand adventure with Miss Norma may be coming to a close. Friday night, Tim and Ramie posted a quote from the 13th~century poet Rumi ~ Life is a balance between holding on and letting go ~ and noted, Today we are letting go. By Saturday afternoon, that post had surpassed 2.3 million page views, twice as many as any previous one. More than 90,000 people had reacted to that post, and more than 30,000 had posted comments full of appreciation and love that continue to roll in. ItÃƒÂ¢Ã‚Â€Ã‚Â™s mind~boggling, Tim said on Saturday afternoon, as he struggled to respond to personal messages. He and Ramie were in the RV with his mother when she died, and they were with her in July 2015 when ~ two days after the death of Leo, her husband of 67 years ~ she was diagnosed with stage 4 uterine cancer. She told her doctor that at her age, she wasnÃƒÂ¢Ã‚Â€Ã‚Â™t going through surgery, chemotherapy or radiation. She also wasnÃƒÂ¢Ã‚Â€Ã‚Â™t going to move into a nursing home, which was option A, because her retired (from journalism and real estate in Arizona) son, Tim, was residing wherever he and his wife (a former school counselor) towed their Airstream trailer. The couple also didnÃƒÂ¢Ã‚Â€Ã‚Â™t want her in a nursing home, so they offered her option B: Join them on the road. Norma, in her soft voice, surprised them by saying, I think IÃƒÂ¢Ã‚Â€Ã‚Â™d like that. Her son and daughter~in~law bought the big RV and a new SUV to tow behind it. Norma had her own suite in the back, and, at her request, a combination washer/dryer. Piecing together a puzzle in the RV during her stay at Bear Run Campground near Portersville, Butler County, Norma told the Post~Gazette that of all her adventures to that point ~ ziplining, riding in a St. PatrickÃƒÂ¢Ã‚Â€Ã‚Â™s Day Parade, being VIP guests at an NBA game, getting her first and next tastes of lobster and Key lime pie ~ her favorites included a hot~air balloon ride (a dream her husband had shared) and touring the new USS Gerald R. Ford aircraft carrier. That last one has interesting ties to her pre~celebrity life. Born in Toledo, Ohio, Norma Gates served in World War II as a nurse in the U.S. Navy WAVES ~ Women Accepted for Voluntary Emergency Service. After the war, her brother introduced her to his best friend, Leo, whoÃƒÂ¢Ã‚Â€Ã‚Â™d served in the Army Air Corps, and they married in 1948. Living in a tiny trailer in Grand Rapids, Mich., they couldnÃƒÂ¢Ã‚Â€Ã‚Â™t even scrape together a nickel for a loaf of bread. So they wrote to their Congressman, who personally delivered their overdue benefit checks. His name was Gerald R. Ford. While Mr. Bauerschmidt worked as a load dispatcher for Toledo Edison power in Toledo, Norma was the consummate housewife as they raised their son and daughter, Stacy. Stacy would go on to work for the U.S. Secret Service, where her achievements included coordinating security for the funeral of President Ford. She died of tongue cancer in 2008, by which time Leo had retired and he and Norma had moved to Presque Isle township, Michigan, on the shore of Lake Huron. The widowed Norma likely would have died there, where Tim and Ramie ~ spending their winters in Mexico ~ rarely saw her. But, together, then went a very different route. TheyÃƒÂ¢Ã‚Â€Ã‚Â™re so glad they did. Ramie interjected: You would have robbed yourself.